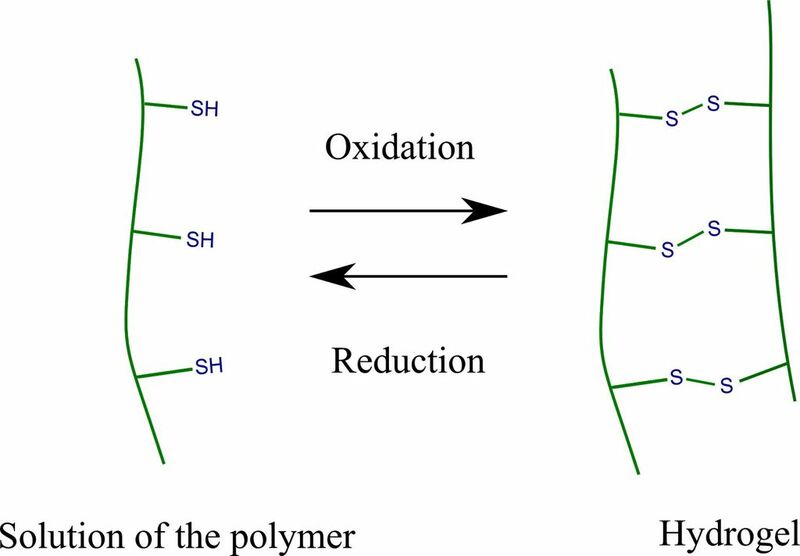 Our latest paper entitled "Poly(aspartic acid) hydrogels showing reversible volume change upon redox stimulus" has been published in European Polymer Journal. You can now watch the final version of the article here. A selection of our publications can be viewed here. The most important task of today's drug formulations is to deliver the drug molecules to the targeted site of the body to reduce the necessary dosage and avoid side effects. Hydrogels as soft polymeric materials with large water content are compatible with the human body and capable to deliver the encapsulated drug in a controllable manner to the desired tissues. We have developed poly(amino acid) based hydrogels responding to the change of physiological parameters (pH and redox potential) and the synthesized gels can be useful in cancer therapy and other diseases related to the altered oxidative state of certain body compartments. The research activity of the Soft Matters Group concentrates on the development of responsive polymer hydrogels with potential biomedical applications. Earlier, we synthesized acrylate based polymer gels with externally controlled properties [1,2]. Our research interest has recently shifted towards the development of poly(amino acid) based gels for pharmaceutical applications . Gels are three-dimensional networks made up of molecules, polymers or particles which are connected by the interaction of different chemical groups . A particularly important class of gels is the polymer hydrogels which are macromolecular networks with large water absorbing capacity and a major part of them is able to interact with its environment by their responsive properties . Responsive hydrogels respond to environmental stimuli with a well-defined change in their volume or stiffness . Thermoresponsive polymers are the most extensively studied representatives here . However, future challenges in medical areas can be answered only by multiresponsive systems that are triggered also by bio-related stimuli, such as carbohydrate concentration (glucose-dependent insulin release, see Figure 1) or increased enzyme levels [8,9]. Figure 1 The gel changes its volume and releases the encapsulated insulin only in the presence of glucose due to the selective interaction of the matrix with saccharides . In situ forming hydrogels that form gel structure at the desired time allow for convenient surgical operation . For example, a thermogelling polymer becomes a gel from an aqueous solution after injection at body temperature  shown in Figure 2. However, the premature gelation of temperature responsive polymers (e.g. due to the heat of friction during injection) can result in the clogging of the syringe. Enzymatic and oxidation induced gelation serve are suitable stimuli to induce gelation in a selective manner, and the latter is easily achieved by mimicking the redox processes in the human body . Figure 2 Injection of the flowable polymer solution (sol) into the targeted body site, followed by the temperature induced gelation. The gelation occurred underneath the skin of a rat . The aim of our work was to synthesize hydrogels based on poly(amino acid)s developed in our group which exhibit well-defined response to the change of the pH and the redox state of the environment. I intended to utilize the thiol-disulphide chemical transformation which was inspired by biological redox processes controlled by the glutathione mediating agent (a thiol containing peptide molecule) . Our goal was to synthesize a hydrogel that forms only after the injection of the polymer solution upon oxidative stimulus. Inherent properties of the starting polymer material such as compatibility with the human tissues, biological degradability and the adhesion of the thiol groups with the biological interfaces might contribute to the successful biomedical application of the matrix developed [14,15]. A significant part of the research was the design of the chemical structure of the hydrogels. Poly(aspartic acid), a synthetic polypeptide type compound was used as starting material and thiol groups were immobilized on the polymer chain. 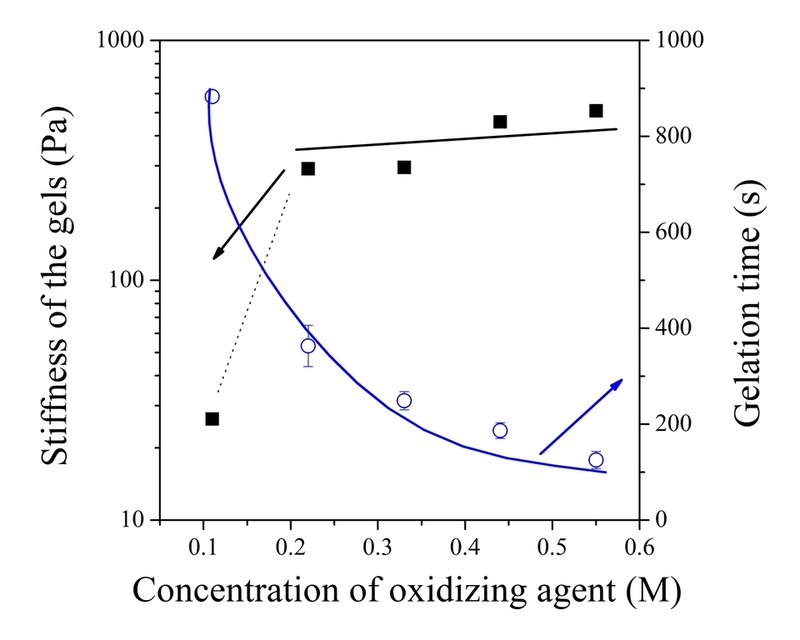 The thiol groups can be chemically linked to each other by oxidation (Figure 3). The chemical structure of the polymers was analyzed by various chemical and spectroscopic methods including nuclear magnetic resonance and Raman microscopy. The thiol containing polymer was exposed to chemical oxidation and the formation of hydrogel was investigated visually and by mechanical tests such as the measurement of elastic strength and rheological profiles. Model drug molecules were encapsulated inside the hydrogels during gelation and the release of the payload was investigated as a function of external redox effects to demonstrate the applicability of the developed hydrogels as reduction facilitated drug delivery vehicles. The synthesis of thiol-containing poly(aspartic acid) was successful according to nuclear magnetic resonance and I proved that the concentration of thiol groups on the polymer chain can be controlled. The polymer could be easily dissolved in water and a flowable solution was yielded. When this solution was exposed to chemical oxidation, a stiff hydrogel formed due to the developing linkages between the thiol groups (Figure 4) [17-20]. 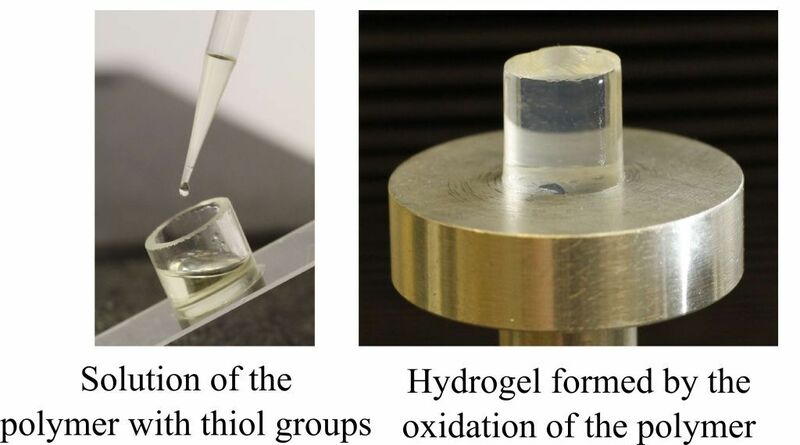 Figure 4 Oxidation induced gel formation of thiol-containing poly(aspartic acid) resulting in bulk hydrogel (width of the gel is approx. 1 cm). The gelation of the polymer solutions was characterized by rheology. The stiffness of the hydrogels was constant and sufficient in a wide concentration range, while the time of gelation could be easily tuned by the chemical composition of the polymer solution (Figure 5). Consequently, the aqueous solution of the polymer can be converted into a hydrogel with predetermined mechanical strength within a time interval suitable for the application as an injectable material. 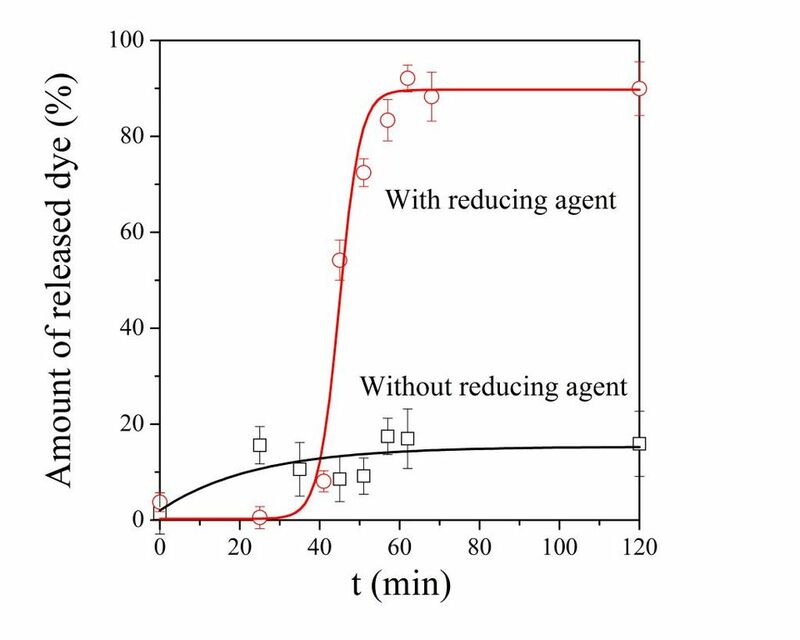 Water-soluble drug molecules were loaded into the hydrogels during gelation and these gels were put into aqueous solution in the presence and in the absence of reducing agent. Only 20% of the molecules were released without reducing agent over the whole time of measurement (Figure 6). After a reductive effect, the whole amount of the entrapped drug was released during a fast release. These results proved that the redox environment controls the release profile of molecules from the developed hydrogels . Figure 6 Reduction-controlled release of molecules from the hydrogels. The success of our work encouraged our group to continue this topic in co-operation with pharmaceutical researchers [21, 22]. We hope that the difficulties in therapy of diseases in the eye such as short residence time and poor bioavailability of the drugs might be overcome by the gelation and the good adhesion of our polymer. Szilágyi A, Zrínyi M. Temperature induced phase transition of interpenetrating polymer networks composed of poly(vinyl alcohol) and copolymers of N-isopropylacrylamide with acrylamide or 2-acrylamido-2-methylpropyl-sulfonic acid. Polymer. 2005;46(23):10011-10016. Sugiura S, Szilágyi A, Sumaru K, Hattori K, Takagi T, Filipcsei G, Zrínyi M, Kanamori T. On-demand microfluidic control by micropatterned light irradiation of a photoresponsive hydrogel sheet. Lab Chip. 2009;9(2):196-198. Gyenes T, Torma V, Gyarmati B, Zrínyi M. Synthesis and swelling properties of novel pH-sensitive poly(aspartic acid) gels. Acta Biomater. 2008;4(3):733-744. Tanaka F. Classical theory of gelation. In: Tanaka F, editor. Polymer Physics. Cambridge, UK: Cambridge University Press; 2011. Park K, Okano T. Biomedical Applications of Hydrogels Handbook. New York, USA: Springer Science+Business Media, LLC; 2010. Roy D, Cambre JN, Sumerlin BS. Future perspectives and recent advances in stimuli-responsive materials. Prog. Polym. Sci. 2010;35:278–301. Rzaev ZMO, Dinçer S, Pişkin E. Functional copolymers of N-isopropylacrylamide for bioengineering applications. Prog. Polym. Sci. 2007;32(5):534-595. Pasparakis G, Vamvakaki M. Multiresponsive polymers: nano-sized assemblies, stimuli-sensitive gels and smart surfaces. Polym. Chem. 2011;2:1234–1248. Ancla C, Lapeyre V, Gosse I, Catargi B, Ravaine V. Designed Glucose-Responsive Microgels with Selective Shrinking Behavior. Langmuir. 2011;27(20):12693-12701. Van Tomme SR, Storm G, Hennink WE. In situ gelling hydrogels for pharmaceutical and biomedical applications. Int. J. Pharm. 2008;355(1–2):1-18. Jeong B, Lee KM, Gutowska A, An YH. Thermogelling Biodegradable Copolymer Aqueous Solutions for Injectable Protein Delivery and Tissue Engineering. Biomacromolecules. 2002;3(4):865-868. Meng FH, Hennink WE, Zhong Z. Reduction-sensitive polymers and bioconjugates for biomedical applications. Biomaterials. 2009;30:2180-2198. Schafer FQ, Buettner GR. Redox environment of the cell as viewed through the redox state of the gluthathione disulfide/gluthathione couple. Free Radic. Biol. Med. 2001;30:1191–1212. Joentgen W, Müller N, Mitschker A, Schmidt H. Polyaspartic Acids. Biopolymers Online: Wiley-VCH Verlag GmbH & Co. KGaA; 2005. Bernkop-Schnürch A, Steininger S. Synthesis and characterisation of mucoadhesive thiolated polymers. Int. J. Pharm. 2000;194:239–247. Ludwig A. The use of mucoadhesive polymers in ocular drug delivery. Adv. Drug Deliver. Rev. 2005;57:1595-1639. Gyarmati B, Vajna B, Némethy Á, László K, Szilágyi A. Redox- and pH-responsive cysteamine-modified poly(aspartic acid) showing a reversible sol–gel transition. Macromol. Biosci. 2013;13(5):633-640. Gyarmati B, Némethy Á, Szilágyi A. Reversible disulphide formation in polymer networks: A versatile functional group from synthesis to applications. Eur. Polym. J. 2013;49(6):1268-1286. Gyarmati B, Némethy Á, Szilágyi A. Reversible response of poly(aspartic acid) hydrogels to external redox and pH stimuli. RSC Adv. 2014;4(17):8764-8771. Krisch E, Messager L, Gyarmati B, Ravaine V, Szilágyi A. Redox- and pH-Responsive Nanogels Based on Thiolated Poly(aspartic acid). Macromolecular Materials and Engineering 2016;301:260-6. Németh C, Szabó D, Gyarmati B, Gerasimov A, Varfolomeev M, Abdullin T, László K, Szilágyi A. Effect of side groups on the properties of cationic polyaspartamides. European Polymer Journal 2017;93: 805-814. Szilágyi BÁ, Gyarmati B, Horvát G, Laki Á, Budai-Szűcs M, Csányi E, Sandri G, Bonferoni MC, Szilágyi A. The effect of thiol content on the gelation and mucoadhesion of thiolated poly(aspartic acid). Polymer International 2017; 66:(11):1538-1545.